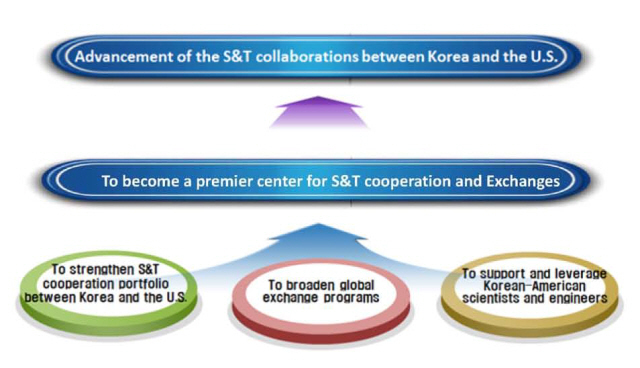 To strengthen S&T cooperation portfolio between Korea and the U.S.
To support and leverage Korean-American scientists and engineers. KUSCO enhances cooperative efforts in science and technology between Korea and the United States and supports mutual cooperation and joint programs between two nations and examine S&T issues related to bilateral U.S.-Korea relationships as well. The center also seeks to assist Korean-American scientists, engineers and young students in developing and maintaining professional networks addressing matters of scientific and technical interest in the U.S. Enhance scientific and technological development of both Korea and the U.S.
Assess significant trends in scientific research and technological developments affecting Korea and the U.S.